UPDATE: The June 21, 2006 West County Times reported that a plan is underway to bring a crematorium to Richmond. Many fear that this will mean more air pollution for an area already beleaguered. The Pacific Institute has actively worked to find solutions West County’s environmental problems, and is against any effort to introduce more pollution to the region. Last year, the Pacific Institute released an assessment of air pollution in West County. “Deluged by Diesel: Health Solutions for West County” was released on July 18, 2005, but it’s findings and recommendations are just as relevant 11 months later. To learn more about this analysis, read below or download the report at right. Residents of West Contra Costa County are exposed to far more than their fair share of toxic diesel pollution, but solutions to reduce diesel pollution abound. That’s the central message of a new report released today by a coalition of concerned organizations and available online without charge. Deluged by Diesel: Healthy Solutions for West County will be presented at the San Pablo City Council meeting on July 18 and to the Richmond Public Safety Committee and to the Contra Costa Board of Supervisors subsequently. The report, which is based on resident-conducted research and expert analysis, looks at innovative ways to reduce pollution in residential areas, and improve community health. It was developed by a coalition that includes, the Neighborhood House of North Richmond, Community Health Initiative, West County Toxics Coalition, Contra Costa Health Services, and the Pacific Institute. According to the report, there is an estimated 6 times more diesel pollution released per square mile in West County than in the County as a whole, and 40 times more than in California. Diesel pollution has been identified as one of the biggest health threats in California and is linked to cancer, heart disease, premature death, and other health problems. Other research shows that diesel soot can trigger and may even cause asthma. This is a serious concern for West County, which in some zip codes has double the asthma rate of the Contra Costa County average. Using an aethalometer – a device that measures the amount of soot in the air – researchers estimated the level of soot, a marker for diesel pollution in West County homes. The indoor air-study component of the report found levels of black soot that were 4 times higher than a home in Lafayette, which is also in Contra Costa County, but is further away from industrial sources. The report recommends a host of solutions developed by community residents and project partners to address the threat of diesel pollution. These include financial incentives to get the dirtiest trucks off the road or retrofitted, better enforcement of a 5-minute idling law, zoning and land use policies to limit land use conflicts between residential areas and sources of diesel pollution, and the creation of a regional truck route with signs and other outreach to ensure that drivers know the best route to avoid residential areas. 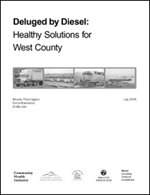 Download Deluged by Diesel: Healthy Solutions for West County.